Is the Warbot-o-calypse coming upon us? We have received reports from several sources that we are about to be overran by Warbots – in an apocalyptic event that is set to make the destruction of the Dome of York appear trivial. "All citizens of Neocron are safe, there is no coming apocalypse”. Although City Administration states there is no cause for concern, runners from other areas seem to disagree. We met a scientist who wishes to remain anonymous. He believes that the Warbots are controlled by a hitherto unknown power and are set to put Neocron to ruin. In preparation, he has been working upon a new weapon to battle the Warbots. It is worth noting that he was unable to provide evidence to back up his claims. The weapon, claimed to significantly improve the chances of those battling against Warbots was not shown to us – however, we managed to acquire a rough sketch. “Tangent Technologies advises against citizens purchasing any weapon that has not been directly developed and certified by us. Further, we will seek to pursue anyone selling or otherwise issuing any weapons which impose upon Tangent’s intellectual property – in a bid to keep unsafe weapons from the streets. In guns, we trust”. It is understood that Tangent Technologies will happily offer advice and testing to runners for a nominal fee. Please contact the Tangent Technologies HQ for further information. We will continue trying to get interviews, and will keep you up to date with any developments. Nice one, we should fear that... I'll stay aware in case of warbots invasion, I hope others will join and hop in the fight ! Housing and Weapons Crisis In Neocron? All times are GMT +2. The time now is 15:51. 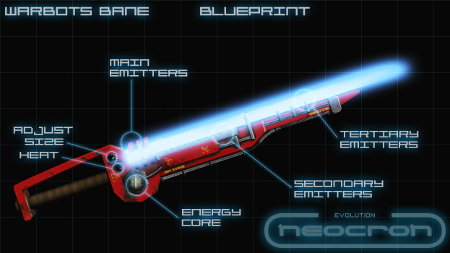 Neocron, the Neocron logo and all related artwork are copyright protected by the respective owners.